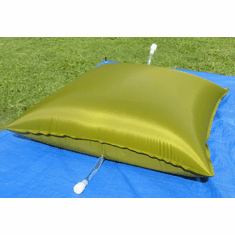 Free Shipping Available on Some Plastic Water Barrels. Your Water supply is the single most important item needed during times of emergency. It is not only needed to drink but is also needed for washing and cleaning. 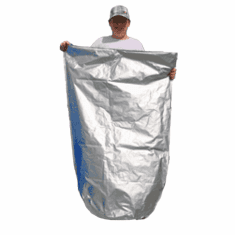 The Most cost-effective way to store emergency water is in a plastic container, collapsible bladder or bag. 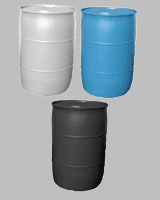 Our plastic barrels are made of (HDPE) High-Density Polyethylene Plastic. HDPE is the material approved by the FDA for water and food product storage. Our new plastic barrels are brand new and factory fresh. 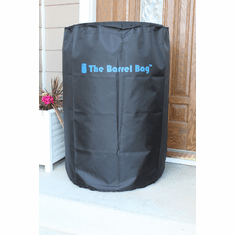 Our reconditioned Rain barrels are one-time use reconditioned, Soft drink and juice Barrels and have been triple washed with antibacterial cleaner. If you need additional information please call at 800.560.2334 where a BayTec Representative will be glad to help. WHAT IS A RAIN BARREL??? How To Install A Bulk Head Fitting In A Water Barrel So a Faucet and Water Hose Can Be Used. 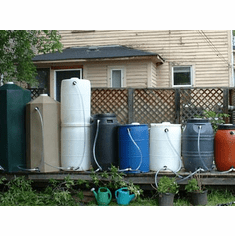 The Most Important Things You Need to Know About Harvesting Water in Water Barrels Or Rain Barrels. 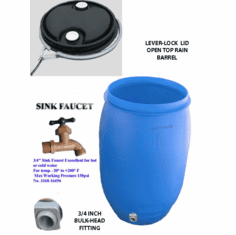 Water Barrel vs Rain Barrel; There is a Lot of Confusion on The Web about what is a Water Barrel. 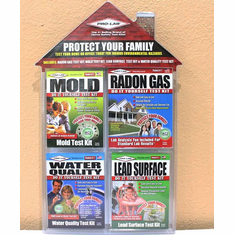 You will Find many Web sites advertise A rain barrel as a water barrel. While many people may search on the Internet for water barrels they may, in fact, want a rain barrel. All the search engines get confused about the difference. While all rain is water, not all water is Rain. 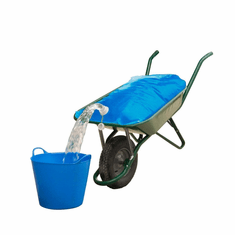 If you intend to store water for long-term use then a Water Barrel is what you need. The water needs to be treated with an additive such as purogene or chlorine dioxide in order for it to be safe to drink or for bath use. 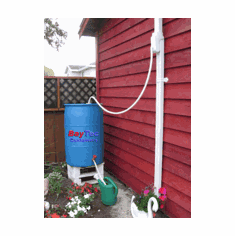 If you need Water for washing and Lawn Watering, then a Rain Water Barrel is what is needed. It must have a bung cap enclosure which cannot be tampered with easily. 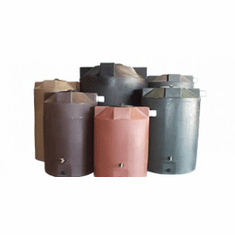 All commercial 15,30 and 55-gallon Barrels have a bung cap which must be closed properly with a bung wrench in order to ensure proper airtight container. As an Emergency Water Storage Supply is essential, a good supply of clean drinkable water should be on everyone's list in case of an Earthquake, Hurricane, Tornado, or even a snow storm. The most thing even more important than food is the long-term storage of emergency water. Most food items need water to be cooked properly and to be eaten. Think Rice, Beans, Bread, and vegetables. Clean clear water can have s bacteria and algae growing and even chemical run-off in it. Not to mention higher than normal levels of lead, mercury, and arsenic! This is why purified long-term water storage is so important. Even if you store perfectly good water, storing it in the wrong way will mean that when you really need it, you will find yourself drinking poison rather than water. Just as critical as knowing how to store water, is knowing how not to store water. A person who is only moderately active needs to drink a minimum of two to three quarts of water each and every day. In areas where the weather is hot, this will require even more water storage. This can also increase with children or with people in poor health. You will also need water for the preparation of food and Bathing as well as washing clothes. A good beginning water storage amount per person should be one gallon each day.. Consider storing at least a three-week storage supply of water for each member of your family which is definitely a good starting point. 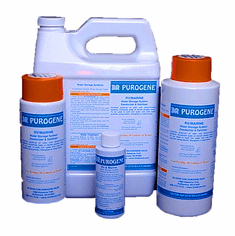 Preparing the Containers Thoroughly before adding purogene is as easy as washing with a little dishwashing liquid and rinsing it completely so there is no residual soap. And in addition for the plastic soft drink or juice barrels. You should sanitize the Barrels by adding a solution of 1 teaspoon of unscented liquid household chlorine bleach and approx one quart (1/4 gallon) of water. Swish the sanitizing solution around in the storage barrel Afterward, the Barrel or Drum should be thoroughly rinsed out so no soap mixture remains in the Container. Then it should be saved to add potable water from a food grade hose or faucet. After you Fill the water drum to the top with regular tap water.which has already been treated with chlorine by your water utility company, you should add additional protection by adding purogene or chlorine dioxide to keep it safe and clean for many, many months. If well water is used than additional treatment with chlorine bleach should be used. by adding two drops of unscented bleach per gallon to the water. The Drum Bung Cap must be Tightly closed By using a Bung Wrench or another tool for the purpose. Contamination is possible if you allow the underside of the cap to contact any other surface so you should wash it before use. After the Drum is safely closed you should write the date and the contents of the container. And if possible store in a dark and cool place. You should inspect the water every six months and repeat the process if you believe the water is not safe to drink. Now we must focus our attention on the Type of Container. All Water Storage Barrels And Rain Water Barrels are available in sizes from 15 gallons on up to 55 gallons. While potable water from the faucet if food to put in a clean new barrel you should not store water for long-term use in a Rain Barrel. A Rain Water Barrel is always open to the air and is therefore perfect for watering grass, plants even farm animals. But for humans, it is not safe to drink, do to the possibility of contamination. And must be purified before use such as boiling or using a water purification filter. Another type of barrel for nondrinking water would be a juice or cola drum that has been properly clean with a cleaner and sterilized with bleach. 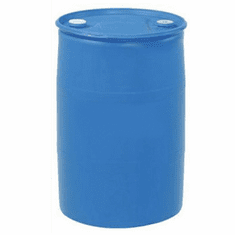 Many people use 15-gallon plastic drums and barrels because they are easy to move and very inexpensive to purchase. While any color barrel can be used, black drums have a carbon light inhibitor that can leach into the water, therefore not good for drinking water. A White barrel will allow light to shine thru it, therefore algae can grow in the water. This leaves us with a Blue Water Barrel which is the best color for water storage. Since many people associate the color blue with water and help to minimize light and algae growth. With the use of purogene, You can feel confident the water is safe to drink. 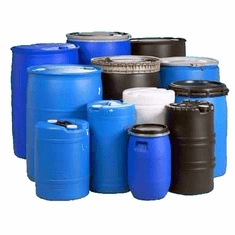 All our barrels and drums are made of HDPE (High-density polyethylene) and therefore never contain BPA. Finally, don't forget you other Disaster Supplies in the case scenario you have to evacuate your home you must take only the most important items with you. You will most likely not have the time to stop and search or even go shopping for the supplies you need. Make you family disaster supply kit now and keep it ready and up-to-date. Every emergency supply kit should include all the items that will support your family form many days or weeks and should start with the necessities Emergency Kit must be stored in a portable plastic container close as possible to your exit door. Please remember to Review the contents of your Emergency supply kit at least twice per year and as your family grows and their needs change. Additionally, you should consider having disaster support supplies in each vehicle and at your place of job location. These are the Minimum Items You should have in Your Kit. Cell Phone and Portable Battery Pack. 3 day supply of nonperishable food and manual can opener. 3-day supply of water (one gallon of water per person, per day). Portable, battery-powered radio or television, and extra batteries. Sanitation and hygiene items (hand sanitizer, moist towelettes, and toilet paper). Kitchen accessories and cooking utensils. Copies of identification and credit cards. Prescription medications, eyeglasses, contact lens solution, and hearing aid batteries. For infants, such as formula, diapers, bottles, and pacifiers. Tools, pet supplies, a map of the local area, and other items to meet your unique family needs. Games to keep Kids busy and Calm. Cooking fuel for the cook stove. In the extreme you may need a red storage container for extra fuel.